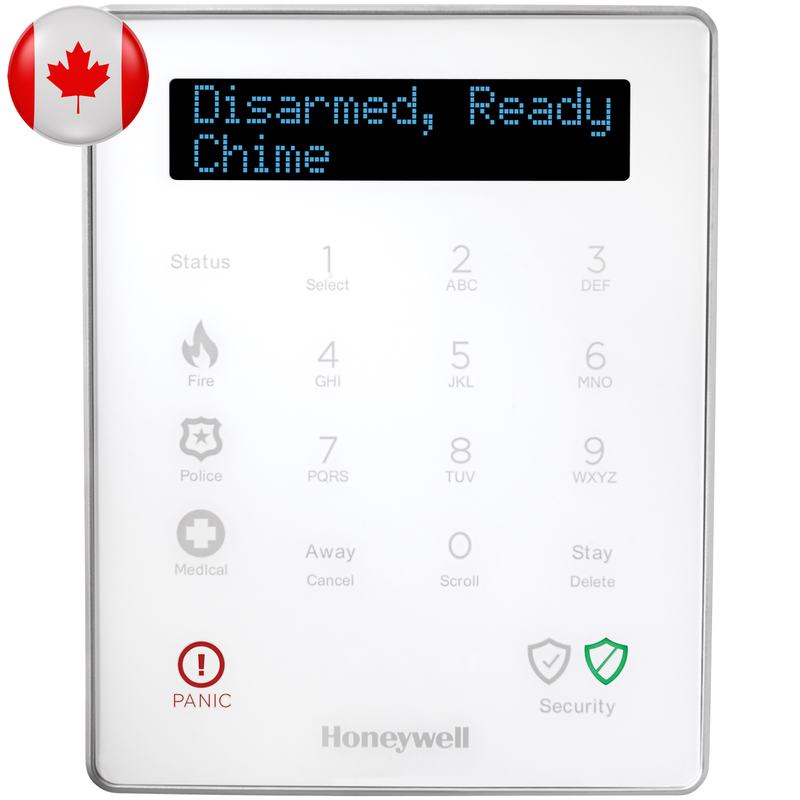 The Honeywell Lyric LKP500-ENC is the wireless secondary keypad (for Canada) that is compatible with systems that work with SiX Series encrypted technology such as the Honeywell Lyric Controller LCP500-LC. The Lyric Keypad takes advantage of the 2.4ghz channel which offers full 128-bit encryption to prevent intruders from jamming the RF signals. With the LKP500-ENC you also get a keypad that is fully supervised. This means that the Lyric Keypad sends signals back to the alarm control panel every 60 seconds making sure it is still within range. If the Lyric Controller does not receive this signal a supervision loss signal will be sent to our professional alarm monitoring station and if you have Total Connect Services activated with AlarmClub you will receive text and email notifications to your smartphone. The Lyric Secondary keypad is small in size, which makes it perfect for mounting in those hard-to-fit places. The sleek and stylish product design, allows the keypad to blend into any decor. The installation of the LKP500-ENC is easy with choices of either wall-mounting or optionally using a Lyric LKP500-DK desk stand kit which is great if you are planning on DIY installing on tabletops, nightstands or kitchen counter. A big benefit of the Lyric Secondary Keypad is its range. Previous 5828/5828v keypads could not be placed further than 50 feet while LKP500-ENC has a listed wireless range of 300ft! 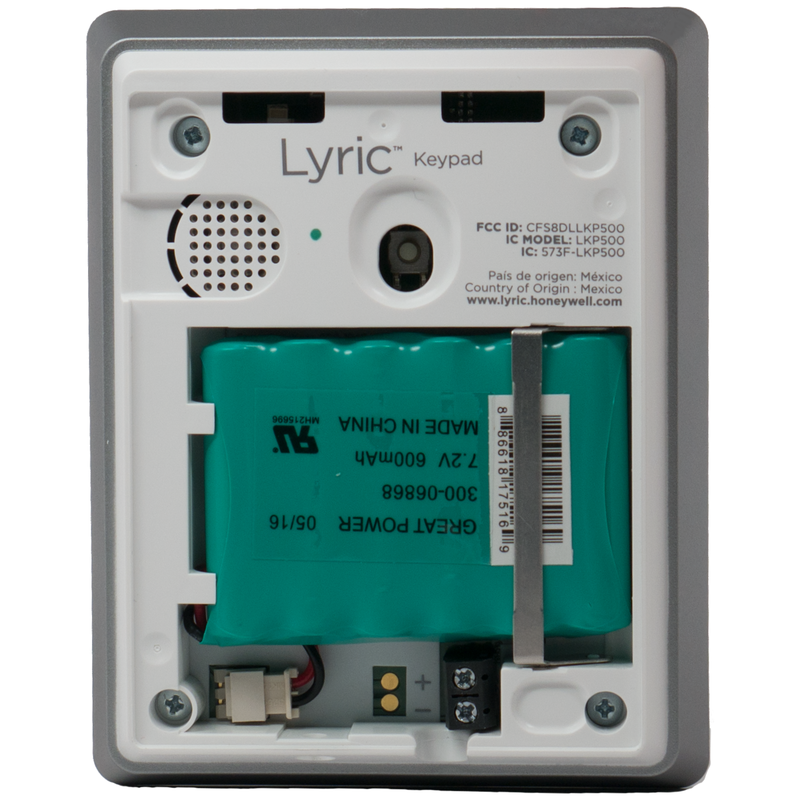 The Lyric Keypad allows you quickly arm and disarm the Honeywell Lyric Security System Kits as well as listen to system status updates with its built-in speaker. One of the greatest benefits of the Lyric LKP500-ENC keypad is its panic button features for police, fire, and medical purposes. The Lyric Controller will allow up to 8 LKP500-ENC to be programmed at any given time. We recommend adding multiple LKP500-ENC wireless Lyric Keypads spread out by the most frequently entered and exited locations such as front doors, garage doors, and master bedrooms. Programming of LKP500-ENC Honeywell keypad is done through the Lyric Controller installer programming menu. To access this area of programming on the controller you must have your installer code. The Lyric Controller default installer code is 4112. Once you access the installer menu select Program. This area of the control panel's programming is the same area that you would program a Honeywell SiXCT door/window contact, Honeywell SiXPIR motion sensor, Honeywell SiXGB, or a Honeywell SiXSIREN although the programming tactics would vary from device to device. With the Honeywell LKP500-ENC you will have access to its own settings menu where you can adjust features such as turn chime on and off, toggle exit tone/entry tone, voice volume, key level, display brightness, and backlight brightness. To access this area of Lyric Keypad settings simply press and hold select key until menu begins, use the scroll key to the settings, use the select key to choose from desired menu item, use the scroll key to toggle menu options, press select key to save your settings and press cancel at any time to exit Lyric Keypad settings menu. When firmware updates are available for this product you can upgrade the software by manually or remotely by AlarmClub. To upgrade the Lyric LKP500-ENC software locally go to the Lyric Controller programming menu select security, tools, enter the master code by default which is 1234, advanced, upgrade sensor firmware. After performing the upgrade command, the keypad displays the upgrade status then, when done, automatically resets twice. Once the Lyric Keypad completes the reset, it will return to normal operation.